St. Louis Cardinals rookie Michael Wacha was able to record his first big league victory in his third start despite allowing a home run to Omar Quintanilla, a sacrifice fly to Marlon Byrd, and walking three batters all in the first inning, Wacha settled down after a rocky first inning to complete six innings, and the Cardinals beat the New York Mets 9-2. He did not allow another run nor did he record another walk after the first inning. Officially, Wacha’s performance is considered a quality start, but he will have to have to be more efficient in future outings, having thrown 102 pictures in six innings of work. The Cardinals’ offense was able to provide more than enough offense to fuel Wacha’s first win. The team got its first run of the game when Matt Holliday scored on a ground out double play by Matt Adams in the fourth inning. Wacha knocked in his first big league RBI on a ground out in the fifth–scoring Jon Jay. The Cardinals broke the game open in the fifth–scoring four more runs on a ground out by Yadier Molina and a three-run home run by Allen Craig. In the seventh, St. Louis tallied two more runs on an RBI single by Holliday and a walk to Jay with the bases loaded. At this point, the Cardinals led the Mets by six runs, 8-2. Shane Robinson, who has raised his average over 50 points in the past week, hit his second home run of the season to make the score 9-2 Cardinals. Due to the bats’ run support and a solid outing by Wacha, the big arms at the back of the bullpen were able to take a night off. Randy Choate pitched one scoreless inning, and rookie, Keith Butler, pitched two scoreless innings–neither reliever allowed a hit. The future role of Wacha is unclear with Jake Westbrook (2-1, 1.62 ERA) set to return from the disabled list and start on Friday against the Miami Marlins. 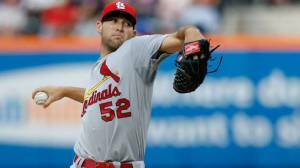 Wacha may stay in the rotation, but he also may be sent to the bullpen or sent back down to Triple-A Memphis.